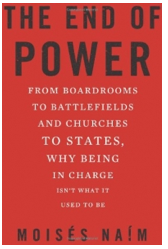 The Real John Davidson: "The End of Power"
At a Toastmaster's meeting one speaker suggested you don't actually need to read a book to be able to talk about it in a social setting. He felt that reading the reviews in the New York Times Book Review allows the reader to project a knowledgeable sophisticated image to those he wanted to impress. We all want to leave good impressions, but sometimes a real deep understanding can only come through serious study. "The End of Power," originally brought to my attention by Fareed Zakaria is such a book that helps explain why the world is different in so many critical ways than a few generations ago. The explanation deals with a lot of simple beliefs, but goes deeper. Power is defined as the ability to direct or prevent the current or future actions of others groups and individuals. It can manifest itself as force or the threat of force, a moral code, persuasiveness, or rewards. All of these means are weakening. Moises believes there are three revolutions in progress that have liberated people and removed barriers to power. One he calls the More Revolution which stems from there being more of everything, especially people, making them harder to control. The Mobile Revolution adds to the dynamic with people and money and ideas flowing much easier offering more options for people not satisfied with their lot in life. The Mentality Revolution refers to expectations and education being higher than ever so that those with power find it more difficult to satisfy. He concedes that social media plays a role, but the three revolutions are more critical. What we see is the emergence of micro powers. They were always there, but so many barriers that mostly they have not had much impact. American politicians are more apt to have to go through a primary to reach power and many factions have a say. Businesses now have access to other sources of financing. One interesting example occurred when the Soviet Union collapsed Russia had a television vacuum that would be filled with movies and programs from other countries including novellas from Columbia. Huge armies still have an impact but most military action is more like guerilla. A few weeks ago I reviewed "Selected" about how leaders are selected. In pre historic times leaders were literally selected and to a significant degree also controlled by followers. Then the Agriculture Revolution and later the Industrial Revolution allowed for a system where leaders were not chosen by the masses, but by elites. Now, as Moises explains times are changing in a different direction. There have always been barriers to power and those who have power have been able to take advantage of the barriers to create more barriers. The three revolutions are all contributing to breaking down the barriers and most of us would agree that there are a lot of benefits. There are still many powerful people and groups that seem well entrenched, but cracks are showing everywhere. There are dangers when power is diffused. "Terrible simplifiers," becoming more common offering simple solutions that in the end only worsen the problems. Moises offers little in the way of concrete suggestions, but points out that while NGO's (i.e. non government organizations) have increased in popularity and trust, political parties are trusted less and less. He gave Obama's campaigns in 2008 as an exception and hoped that other political movements could capture the enthusiasm of large numbers of people who might otherwise become single issue people. The world needs to solve problems. Balance between totalitarianism and anarchy is difficult, but intelligent people with power should be able to work towards one. Moises is confident that as in almost all other fields our political processes will be subjected to innovations that will assure both individual freedom and intelligent collective decisions. In some ways this review is a platform for my beliefs, and can be a small springboard for solutions. My feeling is that this will have to involve education and giving people real voting choices. By education it is necessary that our youngest citizens need to be aware of how the politcal process works (along with alternatives), history, science, logic and the arts. Too many politicians are able to twist logic to attract voters. Politicians have also been able to strategize around splitting opposition or able to drown out logical alternatives with massive spending. We are often bribed with our own money and have our natural selfish interests used against us. To me proportional voting helps alleviate some of this abuse. The American practice of gerrymandering (with similar practices elsewhere) should be minimized.